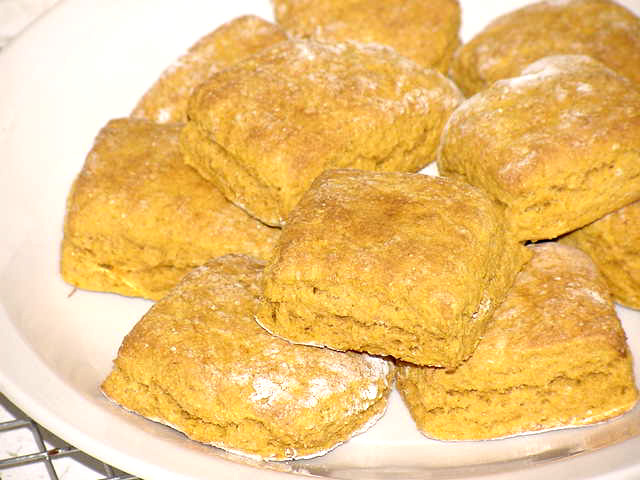 I learned how to make biscuits at an early age. The recipe was simple and virtually foolproof. You just sift together flour, baking powder and salt, cut in some butter, add some liquid, roll, cut and bake. So why did I stop making them? I don't really know. Just something I left back in Texas when I moved up here, I guess. I found this recipe for sweet potato biscuits online at Food Down Under. I copied it and filed it and forgot about it. Until a few weeks ago when I came across it as I was looking through my files. It was right before I made the turkey soup with wheat berries. The picture that accompanied the recipe showed a big beautiful oat muffin that got me thinking about what I could make to go with the soup. I just happened to have a couple of sweet potatoes in the pantry. I roasted hem and mashed them and got to work. The first batch I made (you knew I would make them more than once, didn't you?) came out kind of thin and flat. This was partly because I rolled the dough out too thin, but mainly because my baking powder was a couple of years old, and even though it was still within the expiration date, I figured it had probably lost some of it's pep. So I bought a replacement, rolled it out a little less, and they rose up beautifully. I also used regular unbleached flour with the first batch, and the texture of the dough didn't hold up to the added flavor. I figured regular whole wheat flour would be too heavy, so I tried some of Bob's Red Mill whole wheat pastry flour. It was perfect. 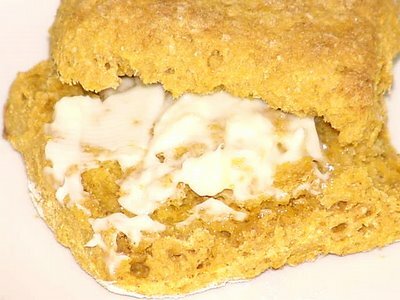 The biscuits have enough substance to keep up with the sweet potato flavor while still managing to be fluffy and light. Sift flour,baking powder and salt into mixing bowl. Cut in shortening/butter. Add potatoes and mix thoroughly, then add enough milk to make a soft dough. Turn out onto a lightly floured board and roll out to about 1/2" thick. Cut into 12 squares. Place squares, not touching, on ungreased baking sheet. Bake in preheated oven for 12-15 minutes. Serve warm, split and spread with room-temperature butter.